Former Bafana Bafana defender Matthew Booth tells Compleat Golfer how he’d rather play in front of 100 000 people than tee off in front of strangers and getting outdriven by his wife, writes WADE PRETORIUS. How did you start your golf ‘career’? How much golf do you play? A fair amount. I’m taking my golf seriously in that I want to lower my handicap. I’m off a 13 and not really playing to it, but I’ve been an 11 before so I’m working towards that again. It helps that my wife, Sonia, is also a keen golfer. I don’t have to negotiate to get a game in like some guys out there [laughs]. We love exploring new golf courses which doesn’t help the handicap – at least that’s my excuse, and I’m sticking to it. And who wins those battles, or would you rather not say? We are both competitive, but I reckon I still have the upper hand. Sonia is improving all the time and is solid off the tee. She outdrives me on occasion, which gets on my nerves. What are your favourite courses in South Africa? the best of the best, it would be a toss-up between Pearl Valley and Pinnacle Point – both are incredible in terms of the challenge and scenery. What is your most feared shot in the game? Any time I have to tee off in front of a few people – even strangers – I get exceptionally nervous. I can’t really handle it. I’d rather play soccer in front of 100 000 people than hit that first shot in front of a few onlookers. 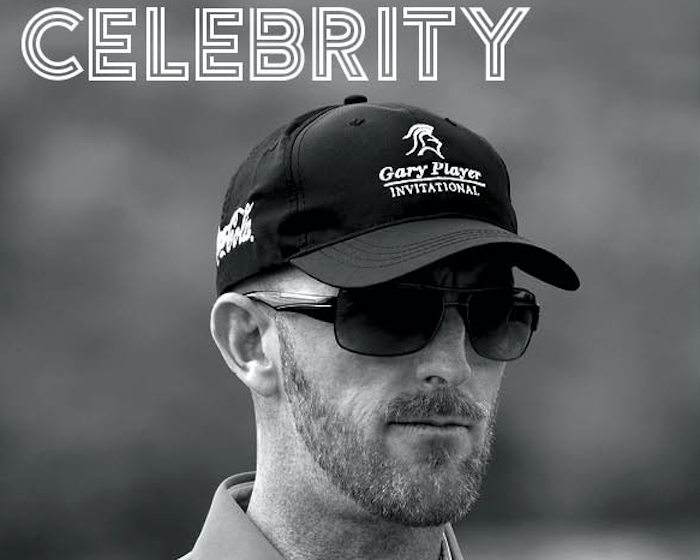 The recent Gary Player Invitational was a real test for me with so many high-profile names and the media watching. What a relief it was to get away with that first shot. Do soccer players also make good golfers? They may not have the same reputation as the cricketers, but there are certainly enough guys who are strong golfers. Darren Keet plays off a four, and Dean Furman and James Keene are also working hard on their game. The older guys like Shaun Bartlett and Andre Arendse are really good – making the most of their free time since retiring. How much golf do you watch on TV? I watch the Majors and other big events but I must say, I’d rather be out there playing than on the couch watching. I enjoy following the progress of pros I’ve either played with or come into contact with, especially when the player is such a quality ambassador for the game, like Brandon Stone. Can you tick a hole-in-one off your bucket list? Which celeb needs to work more on their game? Oh, that’s an easy one. It has to be comedian Dave Levinsohn. He’s got the potential but he needs to spend plenty more time on the course to get his game in better shape. Do you need your golf clubs to be made longer? Ha ha, yes. I was told a while back that the maximum you can extend the clubs is an inch. That did help, but being so tall [1.98m] I still have to crouch. The former Bafana Bafana defender enjoyed a decorated career that spanned 20 years across South Africa, England and Russia. Booth was part of the 2000 Olympic side that beat Brazil in the group phase and was a member of the 2010 World Cup team on home soil. The chorus of ‘Boooooooth’ lives on as the former Mamelodi Sundowns, Ajax Cape Town and Bidvest Wits player appears on the sidelines as an analyst.